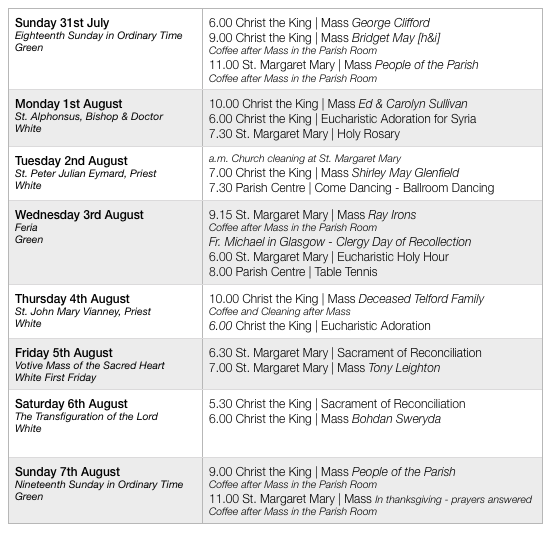 August is an excellent opportunity to come to Mass during the week and spend a bit of quiet time with the Lord. Christ the King Church is open all day - why not nip in? On Tuesday night we celebrated an impromptu Requiem Mass for the repose of the soul of Fr. Jacques Hamel who was murdered at the hands of Islamic fundamentalists during the celebration of Holy Mass in his parish in Normandy, France. Please pray for peace. West Cumbria’s very own jazz and swing dance band are coming to the parish on Saturday 17th September. Tickets cost £10 and include a pie and pea supper. Looks to be a great evening ahead - tickets available from Paul Lovell or from the Parish Centre. Any parishioners who would be interested in helping to set up a Friday night Youth Club/Group in the parish for young people of secondary school age please see Fr. Michael. We hope to have a monthly youth club/group beginning in September. One person has volunteered so far - can you help? This will be held on Saturday 8th October 2016 at Lancaster Cathedral. The bus will be picking up at certain places, and the cost of the Day out is only £10. There is a list at the back of both Churches, so that you can add your name to it if you want to go on this pilgrimage. It is an opportunity to gain the Jubilee Indulgence during this Holy Year of Mercy. Thank you to all who have contributed to this appeal. 63 + 50 + 89 = 202 were at Mass last weekend. Thank you for your offering of £496.33 + £305.06 = £801.39. For the Holy Year of Mercy, the Bishop is leading a pilgrimage to the national shrine of Our Lady, Walsingham, Norfolk: Thursday 29 September – Saturday 1 October. More details from the organiser, Paul Briers: guildshop@yahoo.co.uk or 01946-834834. This church is closed during important restoration work. Mass is celebrated in the Stables adjacent to the Rectory: it has a limited capacity of 30 seats. It is hoped to celebrate the Sacrament of Confirmation in the parish in the Spring of 2017. Young people aged 10 [i.e. Year 6+] and above should be presented for Confirmation. It is essential that parents request this sacrament for their children. Application forms are available from Fr. Michael. Will be celebrated in the parish on Sunday 25th June 2017. Preparation of children [aged 8 or above] to receive Our Lord in Holy Communion for the first time will begin in February 2017. Children and their families should be in regular attendance at Holy Mass each Sunday. 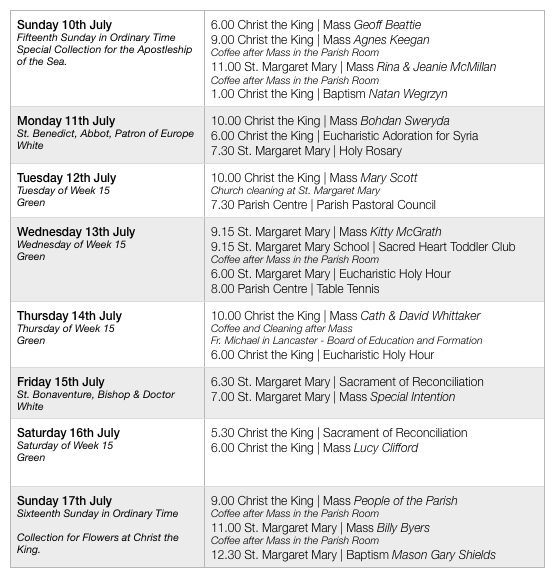 An ideal follow-up to World Youth Day, 25-29 August, at the National Shrine of Our Lady, Walsingham. Visit www.youth2000.org. Spaces are available on a pilgrimage to Lourdes, Nevers & Paris – 8 days by coach departing 3rd September from St Wilfrid's Church, Preston. No overnight travel special price of £515 per person sharing, £650 in a single room. Please contact Northern Star Travel 0161 763 8722 for further details and bookings. A range of CTS Books [including some beautiful books for children] and Pamphlets are available in the porch at Christ the King - an opportunity for some summer reading perhaps? Did you know that volunteers are at the heart of CAFOD’s work? Talented, generous and committed, they offer their time and energy to make a difference. We would like to recruit a CAFOD parish volunteer for Christ the King Church in the parish of the Sacred Heart of Jesus. It would include helping with the Fast Day collections at Lent and Harvest. It doesn’t take a lot of time but it does make a huge difference. If you are interested or would like to know more, please either speak to Father Docherty or contact Patrick Gardner at CAFOD Lancaster on 01772 733310 or email lancaster@cafod.org.uk. Catholic Singles is an organisation which helps single adult Catholics of all ages meet, either one to one or through social events. Please tel. 0161 941 3498, visit the website www.catholicsingles.org.uk or email info@catholicsingles.org.uk. This takes place at St. Margaret Mary on a Tuesday morning and at Christ the King on a Thursday morning - could you spare time to come along and lend a hand? The more the merrier. Summer is an ideal time to spend a moment each day with the Lord. Why not think about coming along to Mass sometime during the week, making an extra effort to deepen your love for the Lord in the Holy Eucharist. Weekday Mass usually lasts around twenty to thirty minutes. There’s also coffee afterwards on a Wednesday or Thursday - if you’re feeling a bit ‘stuck at home’ why not come along? West Cumbria’s very own jazz and swing dance band are coming to the parish on Saturday 17th September. Tickets cost £10 and include a pie and pea supper. Looks like being a great evening - tickets available from Paul Lovell or from the Parish Centre. Any parishioners who would be interested in helping to set up a Friday night Youth Club/Group in the parish for young people of secondary school age, please see Fr. Michael. We hope to have a monthly youth club/group beginning in September. One person has volunteered so far - can you help? 64 + 53 + 103 = 220 were at Mass last weekend. Thank you for your offering of £382.63 + £219.73 = £602.36. Spaces are available on a pilgrimage to Lourdes, Nevers & Paris – 8 days by coach departing 3rd September from St Wilfrid's Church, Preston. No overnight travel and special price of £515 per person sharing/£650 in a single room. Please contact Northern Star Travel on 0161 763 8722 for further details and bookings. Did you know that volunteers are at the heart of CAFOD’s work? Talented, generous and committed, they offer their time and energy to make a difference. We would like to recruit a CAFOD parish volunteer for Christ the King Church in the parish of the Sacred Heart of Jesus. It would include helping with the Fast Day collections at Lent and Harvest. It doesn’t take a lot of time but it does make a huge difference. If you are interested or would like to know more, please speak either to Father Docherty or contact Patrick Gardner at CAFOD Lancaster on 01772 733310 or email lancaster@cafod.org.uk. We are always on the look out for boys and men willing to assist during the celebration of Holy Mass through the ministry of serving. 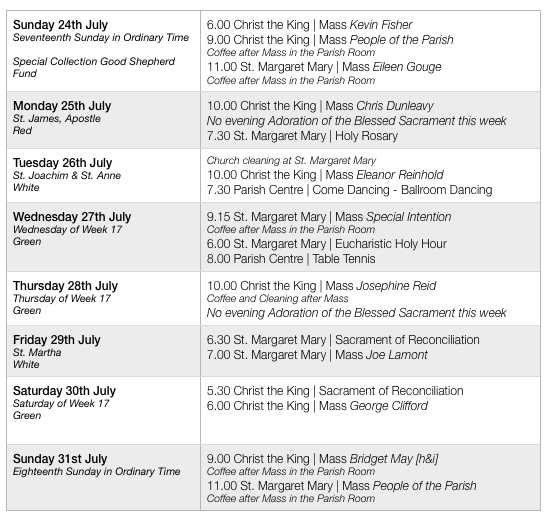 Ideally there should be a server during the celebration of the weekday Mass - any volunteers? Every parishioner will receive, this weekend, a leaflet which gives guidance on funerals in the parish. For a number of years secular or non-Catholic elements have crept in to liturgies celebrated in Catholic Churches - this isn’t in accord with the teaching of the Church nor the way liturgies should be celebrated. It is important that the way we celebrate our faith is a true expression of what the Faith actually professes. There is also a general concern among priests that people are seeking a ‘service’ rather than requesting a Requiem Mass, which is the normal context for a Catholic funeral. It’s important that families are reminded of this - even if family members may be ‘embarrassed’ or ‘uncomfortable’ because they have not attended Mass in a long time. They will be made very welcome and there is nothing to be embarrassed or uncomfortable about - we gather to commend a soul to God and to unite our prayers to those of Christ in the Holy Sacrifice of the Mass. The Bishop has asked me also to remind parishioners that it is the Parish Priest who should “celebrate all the funerals, weddings, baptisms and Masses in the parish - as appointed by the Bishop - unless a family member is a priest. Otherwise other priests are, of course, welcome to concelebrate with the Parish Priest”. All should be aware of this in their planning. This will be held on Saturday 8th October 2016 at Lancaster Cathedral. The bus will be picking up at certain places and the cost of the day out is only £10. There is a list at the back of both Churches, so that you can add your name to it if you want to go on this pilgrimage. It is an opportunity to gain the Jubilee Indulgence during this Holy Year of Mercy. 54 + 87 + 86 = 227 were at Mass last weekend. Thank you for your offering of £393.20 + £290.16 = £683.36. There is a voluntary retiring collection at Christ the King this weekend to fund flowers for the church - the fund is beginning to run a bit low. Our primary school breaks up for the summer holiday on Thursday. The school will gather on Wednesday morning for the celebration of Holy Mass and to thank God for the past year. I wish to extend my thanks and gratitude to the head teacher, Mr Chris Wilkins, and his dedicated and professional staff for their work with the children of the parish this past year. The SAT’s results were, I believe, some of the best in Carlisle - we have a lot to be proud of! I would also like to thank the governing body for their commitment to the school on behalf of the parish - especially to Liz Sproat and Yvonne Desborough who retire from the governing body this summer. From September the school will be federated and work closely with St. Cuthbert’s Catholic Community School. Both schools will share one governing body to form part of what is to be called the ‘St. Ninian Catholic Federation Carlisle’. St. Ninian has connections with Carlisle and his well is within the parish near Brisco in St.Cuthbert Without. His feast day is celebrated on 16th September - it is hoped that a solemn celebration marking the creation of the Federation will be held on the feast. Please keep the school children in your prayers over the summer that they return safe and well to resume their studies and that Year 6 make a happy transition to their new schools. Thanks to all who attended this vigil of prayer. Any parishioners who would be interested in helping to set up a Friday night Youth Club/Group in the parish for young people of secondary school age please see Fr. Michael. We hope to have a monthly youth club/group beginning in September. This will be held on Saturday 8th October 2016 at Lancaster Cathedral. The bus will be picking up at certain places and the cost of the day out is only £10. There is a list at the back of both Churches that you can add your name to if you want to go on this pilgrimage. It is an opportunity to gain the Jubilee Indulgence during this Holy Year of Mercy. Once again we will be delivering food parcels to local families before the start of the school summer holidays. We hope to deliver parcels during the week beginning Monday 18th July. Please check best before dates on goods. Thank you in advance for your continued generosity. 68 + 78 + 90 = 236 were at Mass last weekend. Thank you for your offering of £478.05 + £246.40 = £724.45. This small action group require men’s clothing in medium and small sizes, sleeping bags, blankets and tents, in clearly labelled bags for refugees. These can be taken to the Op Shop charity shops at Harraby, Morton and Botchergate. Phone Rosemary Galloway-Smith on 521497. Many thanks for any help you can provide. From Our Lady’s: The Heritage Lottery Fund has now approved a funding application from the Church of Our Lady & St Wilfrid, Warwick Bridge. The church will be closed after Mass on Sunday 3 July for essential renovation work, scheduled to last around 12 weeks. Mass will be celebrated in the neighbouring Stables building until the work is completed, with a limited capacity of around 30 seats. Young people 16+ are invited to Lancaster University Chaplaincy, Saturday 9 July, 12.30-4.30 pm, for an afternoon celebrating your faith with other young Catholics. See the poster. Further details: richardteasdale11@gmail.com. A holiday and study week for Catholic students and young professionals, 16-23 July, Boarbank Hall. Responding to Laudato Si’, Creation in Genesis, Creation and the Big Bang, Darwin and Christianity. An opportunity for daily prayer and liturgy with a Community. Time to think about your faith. To be part of a small, friendly group. To share home-made meals. Freedom to explore the Cumbrian countryside. See the poster. To book a place, contact Sr Margaret Atkins on 015395-32288 or visit www.boarbankhall.org.uk.The cost of the week, including full board, is £350-£380 for a single room, £300 for a shared room or £225 for students, the low paid and the unwaged. 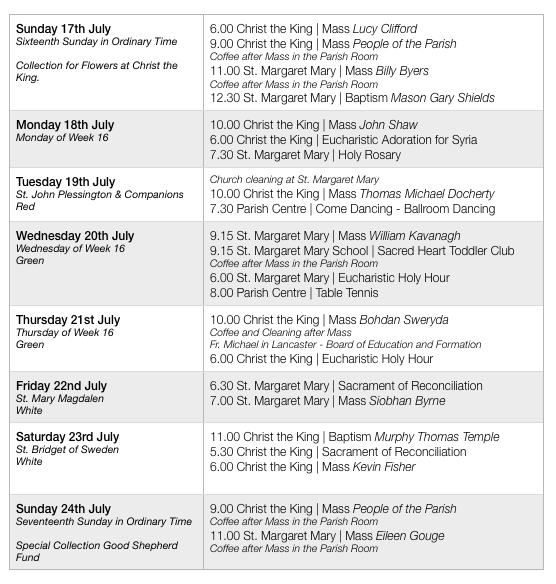 There is a voluntary retiring collection at Christ the King next weekend to fund flowers for the church - the fund is beginning to run a bit low. Will next meet on Tuesday 12th July in the Parish Centre at 7.30 pm. This year, Fr Anthony at OL&SJ is 40 years a Priest. The Parish rejoices with and thanks God for him. He will be celebrating a Mass of thanksgiving at OL&SJ on Sunday 17 July at 10.00 am, with refreshments afterwards in the Waterton Hall. All are very welcome.